Jane Scheyer Wilson, widow of Fermilab founder Robert Wilson, passed away last Tuesday, February 14, in Ithaca, New York. She was 89 years old. As founding first lady, Jane Wilson played a large role in molding Fermilab's character. Her friends, family and colleagues collectively remember her as "sharp-tongued," "irreverent," "generous" and "kind." 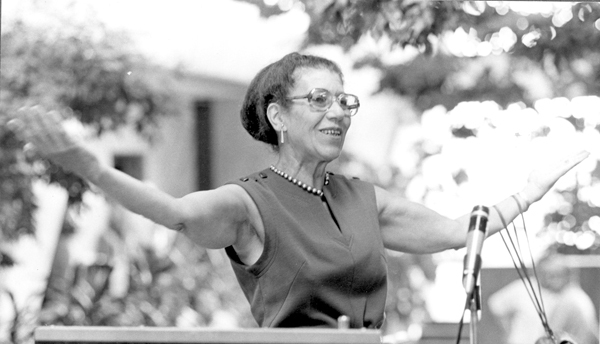 During her lifetime, Wilson was a book editor, an educator, a poet and community organizer. Legal marital status: Events that change an employee's legal marital status include: marriage, divorce, legal separation, annulment, and death of spouse. Number of dependents: Events that change an employee's number of dependents include: birth, adoption, placement of adoption and death. Employment status: Events that change the employment status of the employee, the employee's spouse, or the employees dependent include: commencement or termination of employment, a strike or lock out, commencement or return from an unpaid leave of absence, and a change in work site. Changes in work status that result in becoming eligible or ceasing to be eligible. for coverage including a change between full and part time or between salaried or hourly paid. Dependent satisfies or ceases to satisfy eligibility requirements: Events that cause an employee's dependent to meet or cease to meet the eligibility requirements for coverage based on age, student status or marriage. Significant cost or coverage change: Includes loss of coverage, change of plan, increase or decrease of premium of 20 percent or more. If you experience a qualified status change, you may make a change to your coverage that is consistent with your change in status. You have 31 days from the date of a qualified status change to update your benefit selections. After the 31-day period, you must wait until the next open enrollment period to make your change. If you have any questions regarding your benefits or need the paperwork to change your benefit elections, please contact the Benefits Office at x3395. The themes of competitiveness, innovation and the need for strong education in science and mathematics run through the Administration's FY 2007 budget request to Congress. Within the Department of Education budget request, some new and some existing programs have been pulled together into a $380 million "Preparing America's Students for Global Competition" program, with a major focus on mathematics, as part of the President's American Competitiveness Initiative. Meanwhile, the Education Department's Mathematics and Science Partnership program to improve science and math education would receive flat funding at its FY 2006 level. At NSF, total funding for the Education and Human Resources Directorate would grow slightly under the FY 2007 request. Several changes would be made to division titles and content, with some divisions being combined. Funding for NSF's Math and Science Partnership program would be reduced, with no money provided for new awards, and would be incorporated into the Undergraduate Education Division. Last Sunday the laboratory hosted an Open House for all interested families. Organized through our Education Center, the event brought more than 1200 pre-registered visitors and many walk-ins. 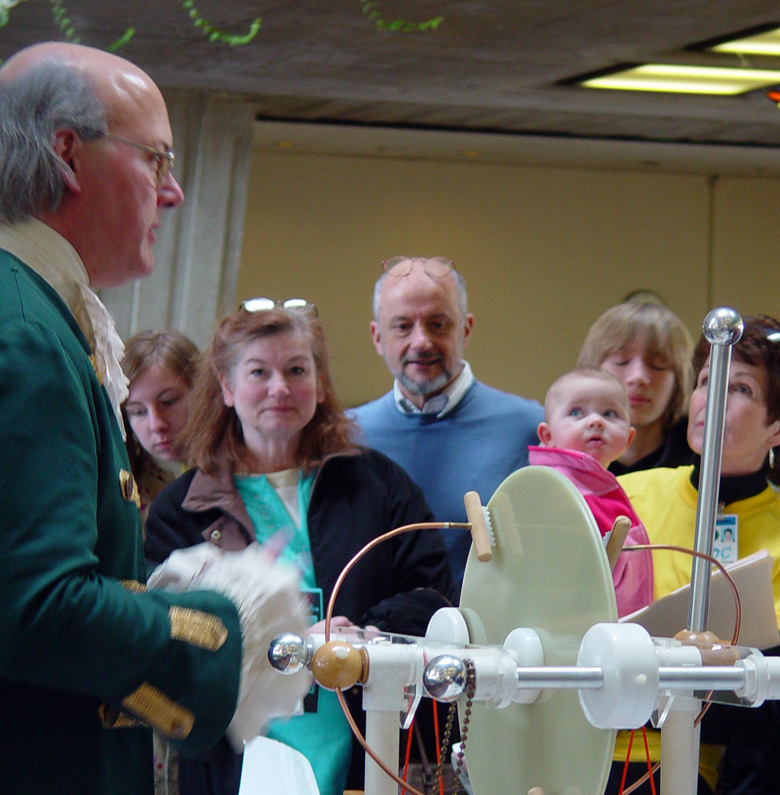 The level of excitement was palpable as many children and their parents attended demonstrations, lectures, storytelling and hands-on activities throughout Wilson Hall and tours beyond. They had the opportunity to ask pressing questions to volunteer scientists from our "Ask-a Scientist" program. Leon Lederman's Late Show was a hit, Leon cracking jokes and the CDF Band supplying the musical punctuation. The youthful scientists (Peter Skands of Fermilab, theorist Anna Goussiou of DZero and Notre Dame and Jason Nielsen of CDF and LBNL) interviewed by Leon in front of a large audience in the auditorium were inspired. I would love to know how many of the children in the audience are now considering a career in particle physics. Todd Johnson as Ben Franklin was surrounded by folks throughout the afternoon, some with their hair on end, fully charged. Michael Albrow on Space and Time, Don Lincoln on Force and Motion, Jean Slaughter on Electricity and Magnetism, Linda Valerio on Physics of Sports, Chris White on Albert Einstein and Jerry Zimmerman as Mr. Freeze and all our other volunteers created a wonderful and exciting afternoon. I want to celebrate these volunteers who made such a successful event possible. They are staff and families of Fermilab who put together a great program and were there to host our visitors. Their devotion to the institution and the enthusiasm for the work we do shines through their efforts. They are our greatest ambassadors to the community and an inspiration to kids of all ages. - Three stores provided 47 hours and 38 minutes of luminosity. - TeV quench during squeeze. - One antiproton transfer lost for store 4653. On Tuesday, February 21, at 8 p.m. WTTW Channel 11 will broadcast "The Ghost Particle," showing how "a 40-year hunt for solar neutrinos leads to a new understanding of matter itself." The program includes interviews with numerous neutrino scientists, including Fermilab's Boris Kayser. More information is at the NOVA Web site. Heartland Blood Centers will conduct the second part of the Fermilab Blood Drive today, February 21, from 8:00 a.m. to 2:00 p.m. in the Wilson Hall Ground Floor NE Training Room. Appointments can be scheduled by calling Lori at x6615. Scottish Country Dancing will meet Tuesday, February 21, at Kuhn Barn on the Fermilab site. Instruction begins at 7:30 p.m. and newcomers are always welcome. Most dances are fully taught and walked through, and you do not need to come with a partner. Info at 630-840-8194 or 630-584-0825 or folkdance@fnal.gov. The site wide print server, FNPRT will be inaccessible on Thursday, February 23 from 6:00am-8:00am due to a software upgrade. There will be a Unix Users Meeting at 1:00 p.m. on Wednesday, February 22 in Curia II . Nicole Gee will talk about the training program coordinated by her department, Kevin Hill will talk about 'Graylisting,' Security will talk about the latest news, and Connie and Troy will talk about Linux updates.